Please check here for changing deadlines and other news. It gives us a great pleasure to invite you to attend the 20th conference of the European Bird Census Council (EBCC) called: Bird Numbers 2016 ’Birds in a changing world’. The conference will be organised by the DDA (Dachverband Deutscher Avifaunisten) with support from the DO-G (Deutsche Ornithologen-Gesellschaft). EBCC conferences are held every three years, bringing together people involved in bird monitoring, research and conservation across Europe and beyond. 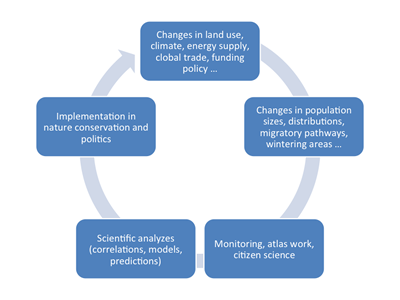 Topics are varied, ranging from the results of new common bird monitoring programs, waterbird monitoring and atlases, studies of causes of population change, demography or distribution in European birds, studies of the effectiveness of conservation action and the impact of government policies, new technologies, methods or analytical techniques, the use of birds as indicators, and the development of citizen science projects. The conference will be held from 5 to 9 September 2016 in Halle (Saale) in the center of Germany. The venue is the campus of the Martin Luther University Halle-Wittenberg in the middle of town. Mid-conference excursions are planned to various locations in the region. We are sure that this will be another successful and inspiring EBCC conference and look forward to welcoming you in Halle.